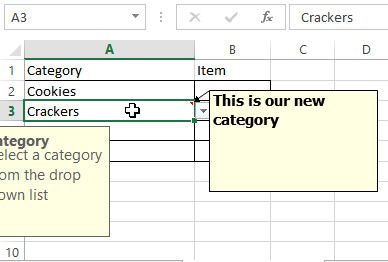 An Input Message can be displayed when a cell is selected. To see the steps for creating an input message and an error message, watch this short video tutorial. The written instructions are below the video. To help people know what data should be entered in a cell, you can set up an Input Message that is displayed when the cell is selected. 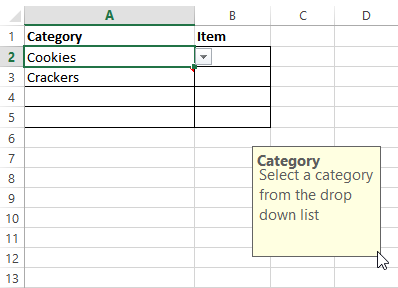 Follow these steps to show a short message when a cell is selected. Type a short message in the Input message box. Press the Enter key, to create line breaks, if you want them. Click OK or follow the steps below to add an Error Alert. Now, when you click on the cell, the Input Message will appear. Although there are 255 characters allowed in the Input Message box, the box has a maximum height and width, and all the characters might not fit. 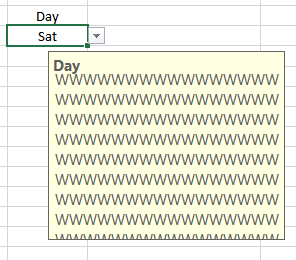 NOTE: The size of the message box cannot be changed -- it is automatically set by Excel. For example, in the message box below, there are 254 "i" characters, with an "X" at the end. However, in the message box below, there are 254 "W" characters, with an "X" at the end. Only 126 of the characters appear in full, and the remaining characters are cut off, or not visible. In most cases, the input message pops below the cell, with the left edge of the message at the middle point of the cell's width. 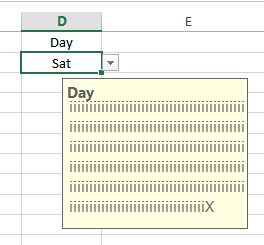 If the cell is close to the right side of the Excel window, the right border of the input message will start at the Excel window border. If there is not enough room below the cell, the input message appears at the right side of the cell, if there is enough room there. If there is not enough room below the cell, or to the right, the input message appears at the left side of the cell. If there is a comment in the cell, the input message appears below the cell, with the right edge of the message at the middle point of the cell's width. 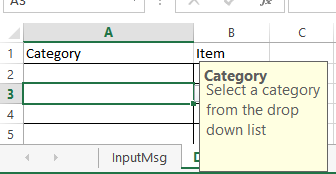 This can cause problems in column A, where there is no room at the left, and the data validation message is cut off. When an input message appears, you can temporarily drag it to a different location on the worksheet. The location is only temporary -- the message box will return to its original position, when you close and reopen the workbook. ALL input messages on that worksheet will appear in that location, until the workbook is closed and reopened. 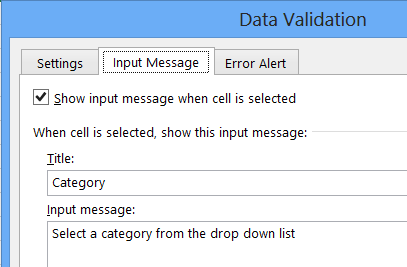 When you add data validation to a cell, the Error Alert feature is automatically turned on. It blocks the users from entering invalid data in the cell. You can turn Error Alert off, to allow people to enter invalid data. Or, change the type of Error Alert, by following the instructions below. 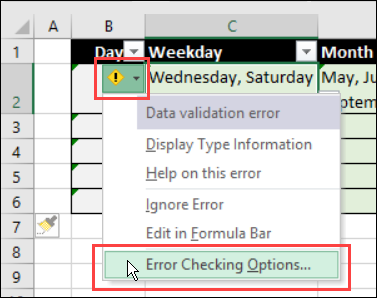 Click on the Error Alert tab, and add a check mark to Show error alert after invalid data is entered . 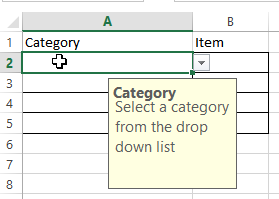 Choose an Error Alert Style from the dropdown list. Stop: Prevents the entry of invalid data. If the Retry button is clicked, the invalid entry is highlighted, and can be overtyped. If the Cancel button is clicked, the invalid entry is deleted, and the cell's original content is restored. Warning: Discourages the entry of invalid data. If the Yes button is clicked, the invalid entry is accepted, and the next cell is selected. If the No button is clicked, the invalid entry is highlighted, and can be overtyped. The user can choose to leave the invalid entry in the cell. Information: Announces the entry of invalid data. 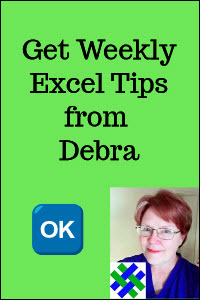 If the OK button is clicked, the invalid entry is accepted, and the next cell is selected. 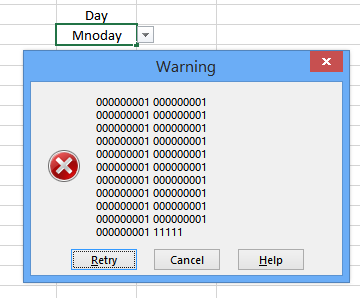 There are 225 characters allowed in the Error Message box, but size of the message box cannot be changed -- it is automatically set by Excel. For messages that are more than a few words, press the Enter key, to create line breaks. Otherwise, the message box could be too wide to read easily. For example, in the message box below, there are 225 characters, with a line break after every second group. Here is the same message, with no line breaks. It is almost the full width of the Excel window. You can turn Error Alert off, to allow people to enter invalid data. 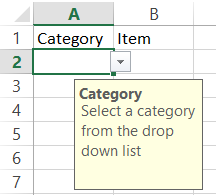 For example, if the data validation cell contains a dropdown list, turn off the Error Alert to allow users to type items that are not in the list. 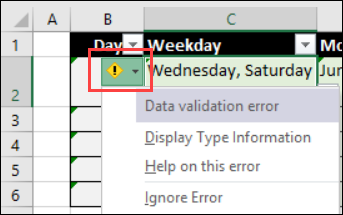 If data validation cells are in a named Excel table, invalid data might be flagged by Excel's Error Checking Rules, even if you have followed the instructions above, to turn off Error Alert messages. 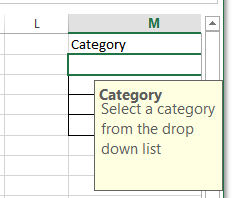 In the screen shot below, error alerts have been turned off, to allow multiple selections from a drop down list. 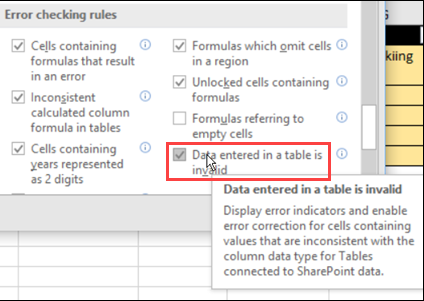 However, there is a Error Checking alert, for a data validation error, because the cell is in a table. You can manually respond to each message, and select Ignore Error. This setting will affect all workbooks that you open. 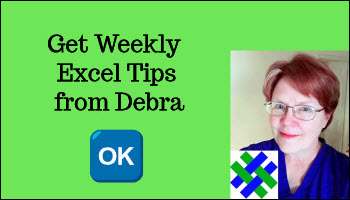 Download a zipped Excel file with the data validation message examples.